Britain To Build New Nuclear Plant, Bucking European Trend : Parallels The plant, to be built by a French company, would be the first in Britain in 20 years. France and Britain are among the few European nations that are planning an energy future with a strong nuclear component. Across much of the continent, existing plants are being phased out, most notably in Germany. 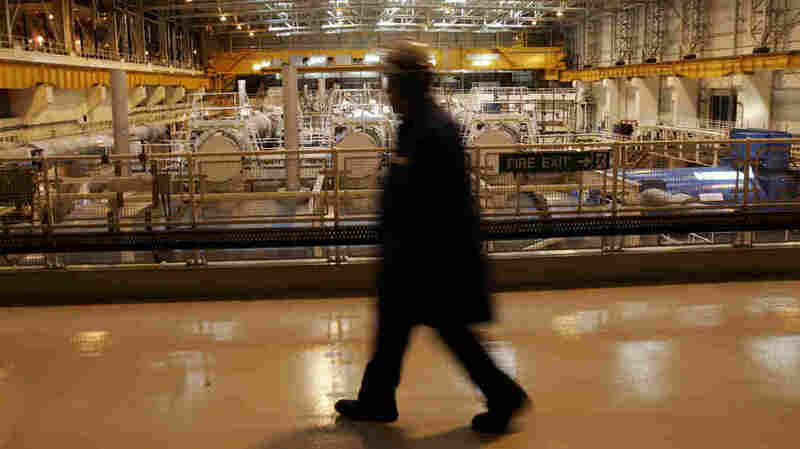 A worker walks inside the turbine hall of the Sizewell nuclear plant in eastern England in 2006. The U.K. government on Monday announced that French-owned EDF would build the first new British nuclear power station in 20 years. Britain has approved the construction of the country's first nuclear power station in 20 years. NPR's Philip Reeves, reporting on the announcement for our Newscast unit, said the move goes counter to a European trend to phase out nuclear power in the aftermath of Japan's Fukushima disaster in 2011. "Most of Britain's 16 nuclear reactors are coming to the end of their lives. Now the government's inked an agreement with a consortium led by the French company EDF Energy to build two new nuclear reactors at Hinkley Point in southwest England. Two state-owned Chinese companies are expected to have a sizable stake. Anti-nuclear sentiment in Britain is low-key compared to some European nations: Germany's phasing out nuclear power after the Fukushima disaster. But this deal will be controversial. Attention is focusing on China's involvement — and the price. The consortium is footing the massive construction costs in return for a guaranteed fixed price for the electricity it produces — that's far higher than current rates." But as the BBC notes the announcement isn't legally binding. EDF will make a final decision on the project in 2014. The project also needs European Commission clearance. As has been the case for years, France relies on nuclear power for more than three-quarters of its energy needs. And nuclear power enjoys broad public support in the country — at least until the Fukushima disaster. But France and now Britain are among the few European states that see nuclear power as playing a significant role in the future. Across much of Europe, it's a different story. Existing plants are being phased out, including in Belgium and Germany. Indeed, Germany's goals are far-reaching: It plans to close all nuclear power stations by 2022. The aim, as NPR's Eric Westervelt reported last year, is "to have solar, wind and other renewables account for nearly 40 percent of the energy for Europe's largest economy in a decade, and 80 percent by 2050." "The fact is, the post-Fukushima consensus in Germany has given way to growing concerns about rising energy costs. The debate is intensifying over just who will pay for the transition to renewable energy, how it will happen, how fast — and through whose backyards." Further afield, Japan was a major proponent of nuclear power until the Fukushima disaster. Until 2011, about 30 percent of electricity in Japan came from nuclear sources. The plan was to increase the share to 40 percent by 2017. But last year, just 2.1 percent of Japan's electricity came from its nuclear plants.